Grilling vegetables is the way I love to start any cookout. Start out by making your chimichurri sauce. While the grill is getting warmed up, prep your vegetables and lightly season with olive oil, salt, pepper and herbs. 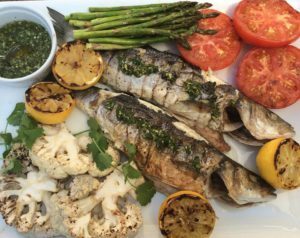 After the vegetables are cooked, remove and place your seasoned branzino on the grill. I like to grill my vegetables first because if there are any leftovers I can use them in a future meal. Arrange the grilled vegetables leaving room for your branzino on your favorite platter. Arrange the grilled fish on the platter, and garnish with sprigs of fresh cilantro or parsley. Serve with chimichurri sauce. This is a perfect dish for those following a paleo, gluten free, dairy free, food regimen. 1. Pulse garlic and scallion in a food processor until finely chopped. 2. Add parsley, cilantro and oregano and pulse until chopped. 3. Transfer mixture into a serving bowl. Add the Olive oil, vinegar and stir. 4. Season with salt and red chili flakes to taste. 5. Let sit at room temperature while grilling your fish and vegetables. 1. Light grill, and lightly oil the grate. 3. Over medium-high heat, cook cauliflower on the grill until char marks appear, 2 to 3 minutes per side. 1. Lightly oil the grate. 2. Drizzle oil over the asparagus and turn spears until they are evenly coated. Sprinkle with salt and pepper and turn again. Grill asparagus for 3-5 minutes over a hot grill. Make sure to turn spears to grill evenly about every minute or so. 2. Rub cut lemons with olive oil. Place the halves cut-side down on a hot grill. Cook until they begin to char, about 5 minutes. 2. Rub cut tomatoes with olive oil. Place the tomatoes cut side down on the grill. Cover the grill and let cook for about 3 minutes. Use a metal spatula to lift and remove the tomatoes off the grill. Place vegetables on the serving platter alongside the Branzini, drizzling a bit more olive oil on the vegetables. Sprinkle with salt and pepper to taste. Serve with chimichurri. Light a grill either gas or charcoal. Season the fish cavities with salt and pepper. Rub the outside of the Branzino with the olive oil and season with salt and pepper. Grill the Branzino over high heat, turning once, until browned and crisp and just cooked through, about 7-9 minutes per side. Serve with Charred Lemon, Grilled Cauliflower, Tomatoes and Asparagus. Pass the Chimichurri to one another.